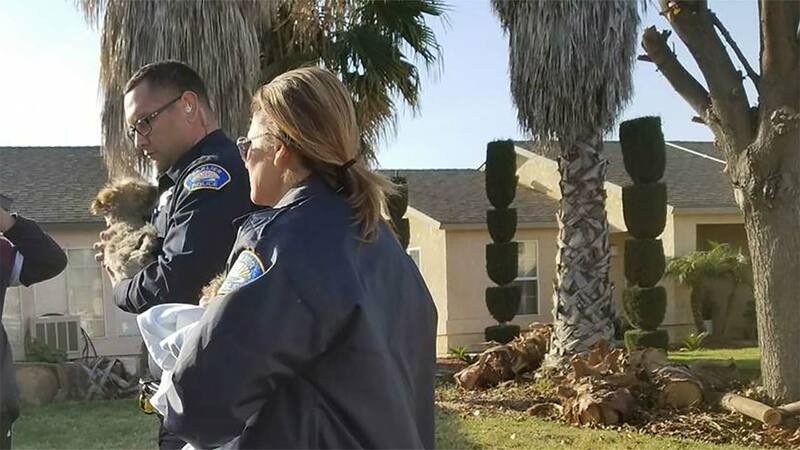 PARLIER, Calif. (KFSN) -- Three Parlier Police Officers are being hailed as heroes after they risked their lives to save puppies from a burning garage. Tuesday morning, police responded to a call of a house fire on Amigo Street. Officers Corona, Jaurique, and Torres arrived and were first on the scene. The officers said they saw black smoke coming from the garage of the home. Authorities said a young female came running out of the residence yelling in a panic that her dogs were trapped inside of the burning garage and that no one else was inside of the residence but pleaded for help. Officer Corona rushed to the garage door, pulling the handle, and opening it. Officer Torres then ran inside and was able to get a hold of two puppies that were in the middle of the garage in a kennel. He pulled the extremely hot kennel out of the garage as the fumes and smoke filled the area, and dragged the kennel to safety, assuring the dogs were out of the fire. Officer Corona sustained a minor burn to his hand while trying to get to another dog trapped inside of the garage. Officials said propane tanks in the area were going off which caused the fire to escalate quicker than usual. That forced the officers on scene to back up from the area as the fire was spreading too fast. Officers checked the neighboring homes for safety while cylinders containing propane gas aligned to the side of the home were removed so they would not catch fire. Officers Jaurique and Torres worked together to get the cylinders out of the area and into a secure place, while Officer Corona stopped the fire from spreading onto the parked vehicles in the driveway. The surrounding residences were evacuated and people were taken to safety. Once Fresno County Fire arrived they were able to quickly put out the fire. Unfortunately, a third dog was not able to be rescued and did not survive. The family was informed and was offered assistance by Red Cross and Fresno County Fire. The two puppies saved were returned to their owners. Officials said the quick action of the officers and hard work from the firefighters helped stop the flames from spreading any further. The family was thankful no one was hurt and the lives of the two puppies were saved, as well as the Christmas tree.